Compliance training affects just about every single organization around the world. It can be comprised of anything from a review of the employee manual to training on critical life or death issues. Yet, despite its reach and implications, many organizations struggle with developing ways to make this training more engaging and strategic. 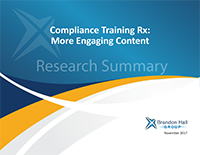 Brandon Hall Group’s 2017 Compliance Training Study offers insights into organizations run their compliance training and outlines key takeaways. Download the survey results, sponsored by Skillsoft.